Philadelphia Flyers 2nd overall draft pick, Nolan Patrick, had to leave the game against the Anaheim Ducks after suffering what appears to be a head injury. Patrick was hit into the board with a shoulder to shoulder check by Chris Wagner and his head hit the glass with force. He remained on the ice for several moments until he was eventually escorted back to the locker room. He did not return to the game and watched the third period from the press box. 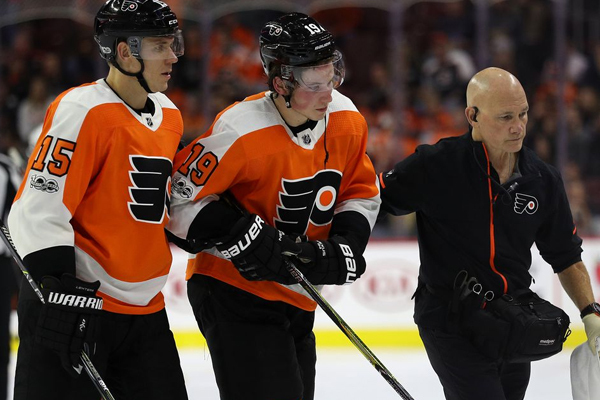 Ron Hextall, the Flyers general manager said the team would know more about Patrick’s status on Wednesday. Wagner was not penalized for the hit and coach Dave Hakstol didn’t have a problem with it. Patrick recorded one goal and two assists in nine games prior to the injury.